We all hoped beyond hope that Senator Reid would fix the filibuster problem that has ground Washington to a halt. Instead, he put his trust in yet one more handshake deal with a charlatan named Mitch McConnell who broke that deal shortly after making it. As result, nominations have been held, filibustered and ground to a standstill. Unable to be confirmed, nominee after nominee has withdrawn forcing the administration to have to start over from scratch. Instead of confirming the best and brightest, rule-by-the-minority is forcing confirmation of the weakest possible progressive candidates possible. “Today, Senator McConnell defended the status quo of gridlock and obstruction in Washington, saying ‘there is no real problem here.’ I could not disagree more. Senator McConnell may choose to ignore it, but the problem of gridlock in Washington is real and it needs to be fixed. Presidents — be they Republican or Democratic — deserve to have the people working for them that they choose. The Senate’s role is to advise and consent. But Republicans have corrupted the Founders’ intent, creating an unreasonable and unworkable standard whereby the weakest of rationales is often cited as sufficient basis for blocking major nominees. Due to Republican obstruction, the de facto threshold for too many nominees to be confirmed has risen from a simple majority to a super-majority of 60 votes. On judicial nominees, Republicans’ obstruction is equally unprecedented…There is no reason to delay qualified nominees for so long except delay itself, and it is little wonder we have a judicial vacancy crisis in this country. Since its original passage in 1994, VAWA (Violence Against Women Act) has dramatically enhanced our nation’s response to violence against girls and women, boys and men. More victims report domestic violence to the police and the rate of non-fatal intimate partner violence against women has decreased by 64%. VAWA provides for a coordinated community approach, improving collaboration between law enforcement and victim services providers to better meet the needs of victims. These comprehensive and cost-effective programs not only save lives, they also save money. In fact, VAWA saved nearly $12.6 billion in net averted social costs in just its first six years. Get to know these faces ladies. It’s time to watch closely, just exactly how they vote on issues near and dear to our hearts. If, through their words, their actions and their votes, they’re showing us that WE have NO value, then it’s clearly time that WE, as women, show them that they have no value and that WE no longer want them in decision and leadership positions where they would be able to impose their lack of values on us. 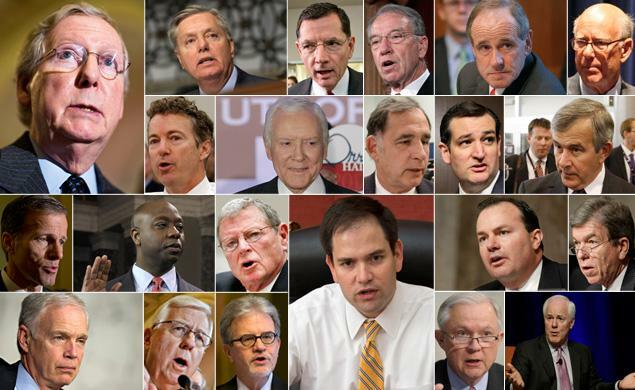 Two faces in particular are quite disappointing, Sen. Tim Scott and Sen. Marco Rubio. Apparently they’ve clearly joined the “I’ve got mine, good luck getting yours” club. Reauthorization of the law, first passed in 1994, now heads to the House, where swift passage is far from guaranteed. House Republicans killed the legislation last year, though Democrats have now dropped some of the provisions that drew GOP objections, including expanded visas for abused immigrants.